THE local trade and industry community gathered en masse last Friday night at the Silver Tassie Hotel for this year’s Letterkenny Business Awards. Celebrating the locality’s abundance of business talent and its entrepreneurial spirit, the gala event was the culmination of seven months’ worth of nominations, short-listings and voting. At last, the winners of the fifteen prestigious categories were announced with David Gildea of CloudRanger scooping the coveted Business Person of the Year Award. 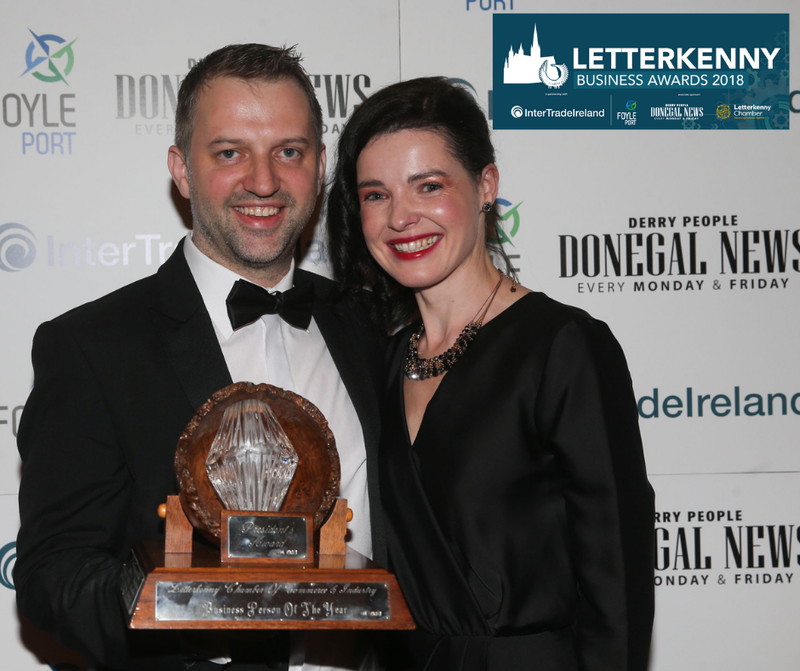 Organised jointly by the Donegal News and Letterkenny Chamber of Commerce, the glamorous event was in partnership with InterTradeIreland and associate sponsor Foyle Port. Compère for the evening was local man Keith Fletcher with guest speakers, Grant Gilmore, Brexit Manager at InterTradeIreland, Brain McGrath, Chief Executive at Foyle Port, Columba Gill, Editor of the Donegal News and Leonard Watson, President of Letterkenny Chamber of Commerce. David Gildea of CloudRanger, 2018 Business Person of the Year and his wife Marie. The Gala ceremony was a fitting finale for the Business Awards that launched back in May when businesses and individuals were asked to nominate themselves or others. The awards process also included a judging panel, secret shoppers and a huge amount of in-paper and online publicity for all nominees shortlisted. Demand for tickets was unprecedented as supporters turned out to back the nominees in search for glory and what a night it was with gongs handed out to all the winners and finalists. With the entry stage and shortlisting process completed readers, customers and general public are invited to support their favourite nominees by voting online. The nominees will be profiled on a weekly basis.Click through to the VOTE section above for more info. For further information on any of the above please contact Toni Forrester, Letterkenny Chamber on 074 9124866 or email: toni@letterkennychamber.com.